← Planning a Great High School Graduation Party – Part 5 of 7- The Play List. In the last installment of this series, I talked about how to set up a great music list. Next we will talk about party decorations, and having a great display to show off your graduate. Decorations are mostly a matter of taste for you and your family. As I mentioned in the installment on tables, tents and chairs, you will want to make sure that you have coverings on your tables. We also included balloons sporting the graduate’s High School colors. Some people like to have centerpieces on their tables. These days you can find a lot of great ideas on Pinterest that are easy on the budget, and fun to make. 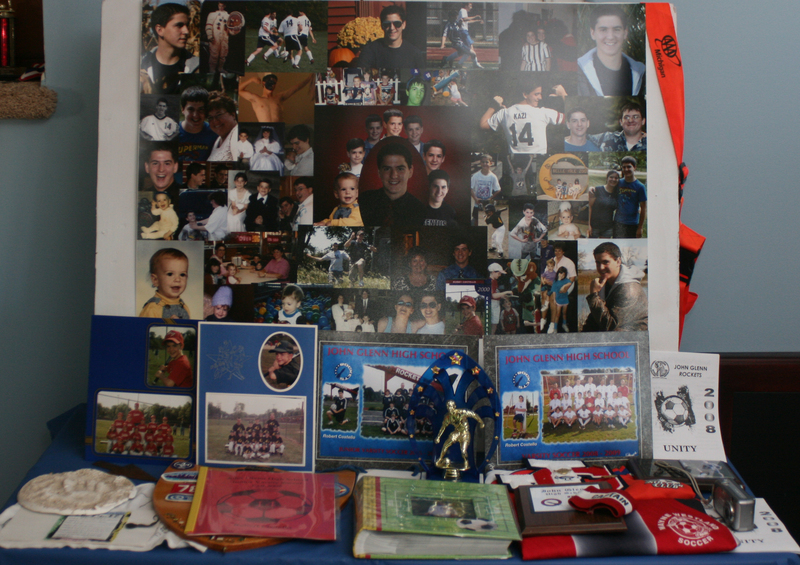 Many graduates groan at the idea of the tribute table, or shrine to their accomplishments. Guests, however, love them. We had two main things combined in our display – a photo board, and a table of certificates or awards. You can do a lot with the certificates and awards. The easiest, and least expensive is to create a binder with clear pages to insert the certificates. My wife and I are “savers”, so we had fun little things from the kindergarten years, all the way through graduation. Don’t limit yourself to just formal awards, have some fun and include old art projects as well. The idea is to showcase the student in a way that helps guests get to know her or him. If they are athletes, include any ribbons or trophies associated with that. Don’t be afraid to pull out the old science project as well. Taping the photos on the board has a tendency to damage the photos. Using individual prints means that you are pulling them out of whatever sorting method you have for your photos, which presents challenges in getting them back in order. Graduates today were born in a time when the majority of the photos taken of them are digital, so you either have to have prints made, or find another solution. Our solution was to create a collage in software. This allowed us to do some basic editing of the photos, like cropping or enlarging for emphasis. We had to scan in some of the pictures we had, such as school or sports related pictures, but this was relatively easy. Once we had all the pictures ready, we put them together in a large format, our last party featured a 36” X 24” poster which we attached to our stand-up photo board. You can find many places to print these which are relatively inexpensive. The other advantage of having them on a poster is that you can save the poster for future use. If you are a scrapbook maker, you can also have those out. I know some moms who spend much of their graduate’s senior year creating scrapbook pages. The nice thing about those is that once the party is over, you can give the book to the graduate as a lifelong keepsake. 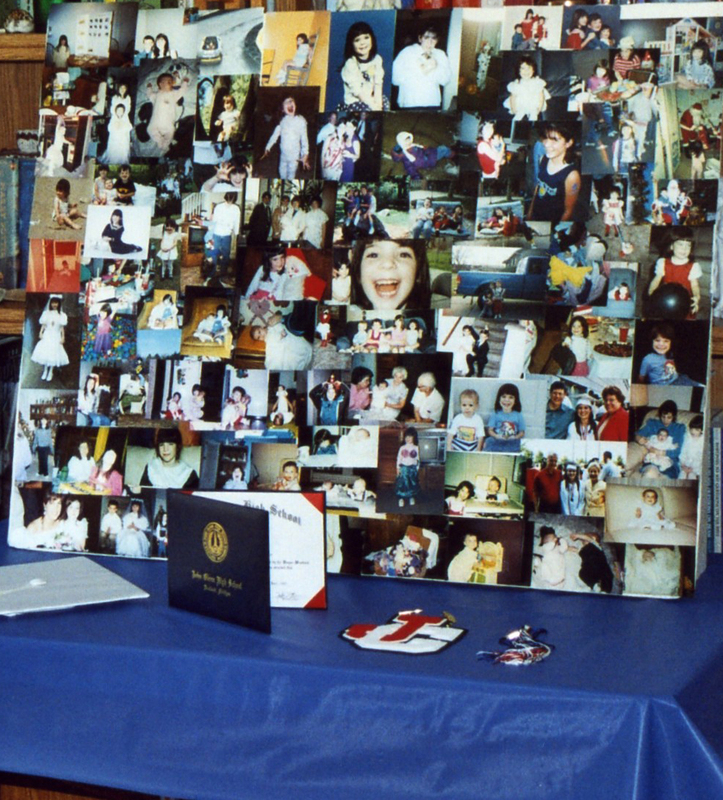 By the time our youngest graduated we also had a few electronic frames. Those also were loaded up with photos from Scouts, sports and such. It made the display dynamic and fun. One last thing I have seen, which also lends itself well to a keepsake, is the idea of creating a DVD of photos from throughout their lives. I have been to a few parties where this was left running in a continuous loop on a television. If you are going this route, my suggestion is to limit the loop to about 10 minutes. Any longer, and people will be frustrated at how long it takes to view, as they will want to see it all. You can get inexpensive, or even free software for making fun DVDs. The important thing about the display of photos is to showcase the graduate. You will have some guests at your house who may not know them as well as others. Having a fun, interactive display will generate stories of their lives. Yes, the graduates may groan and even be a bit embarrassed. But, isn’t that what we parents are supposed to do? In the next installment of this series, I will talk about capturing the memories of the day itself. This entry was posted in Party Planning! and tagged bobby-c, electronic picture frames, graduation party, high school graduation, party, party planning, photo board, photo display. Bookmark the permalink. great job on this Bob, also great advice, been reading your installments, Isn’t it great that our years of experience as parent’s lends us such opportunities to share great memories.